If you are a regular follower of my blog you know that last year I quit my full-time job and became a full-time Domestic Goddess, as my husband likes to call me. Being home full-time has given men the freedom to do lots and lots and lots of cooking. I have always liked being in the kitchen and cooking for my family. But having the time to try new recipes, and being diligent about menu planning can become a difficult routine to follow when you are working full-time and juggling your job and family/household needs. You know when you are a working full-time and seeing to the needs of your family I think you get into a cooking “rut”. Even when you do your menu planning it’s easy to get into a rut and just make the same dinners week after week. I think it is kind of like “comfort foods”. You have this set catalog of recipes that you are familiar with and “comfortable” preparing for your family. This mindset alone made it difficult for me to say to myself that I should try something new. Hot Dogs or Hamburgers on the grill with chips, etc. So, I would rotate these meals, and Friday would be pizza night or take-out night, and then the rotation would start over again. And just to be clear this list is just an example of the cooking rut I found myself in. But, I did not really discover that fact until I stopped working. That was an eye-opener for me. I have always loved cooking, but it just became monotonous and routine for me. It was comfortable, and not stressful for me that way. But now, being the new and improved “Domestic Goddess” that I am, I am able to love trying new recipes, and being way more adventurous with my cooking. And it is so much fun discovering new recipes that the family likes. It becomes fun to “rate the recipe”. Kind of a gauge of how everyone liked the recipe and would I make it again. Some great resources that I have found online and like for new recipe ideas are; The Pioneer Woman, All Recipes, and Cooks.com Each of these sites has their own unique advantages. Any of the Pioneer Woman recipes have always been delicious. I was just telling the kids the other night that I don’t think there is a recipe that I have tried that we did not like. The All Recipe, and Cooks.com sites are very practical and easy to follow. They both have good search tools, ad you can really find a recipe for anything. Homemade Spaghetti Sauce with Italian Sausage & Mushrooms – make a double batch of sauce and use the leftovers to make lasagna. This was an amazing recipe: Pioneer Woman’s Best Lasagna Ever . I will never buy the Stouffer’s frozen variety again! Jambalaya with Summer sausage, grilled onions and peppers, and rice of course. This is my daughter Naomi’s creation and it’s delicious. Homemade pizza in the oven or on the grill when Travel Man is home. Here’s a link to the recipe I now use for my homemade pizza sauce. Beef Stew in the crock pot with Bisquik cheese biscuits. This recipe is from the Fix It and Forget Cookbook. See the details below. Chicken Breast in the crock pot seasoned with taco seasoning to make shredded chicken for tacos, nachos, fajitas,etc. Another creation from daughter, Naomi. Homemade Macaroni and Cheese , Pioneer Woman style, and this could be a meal all by itself. We usually have it with some sort of baked chicken. Broccoli Cheese Soup – another one of my Pioneer Woman all time faves!! Turkey Tetrazzini – This was a favorite with the leftover turkey meat at holiday time. Chicken Tacos that were pan-fried in the shell – Totally yummy. What a turn-around from my previous “in a rut” menu. And I also make a lot more salads to go with the dinners than I ever did. You can tell that I have truly enjoyed the Pioneer Woman recipes. The recipes are nothing complicated, but always packed with great flavor. 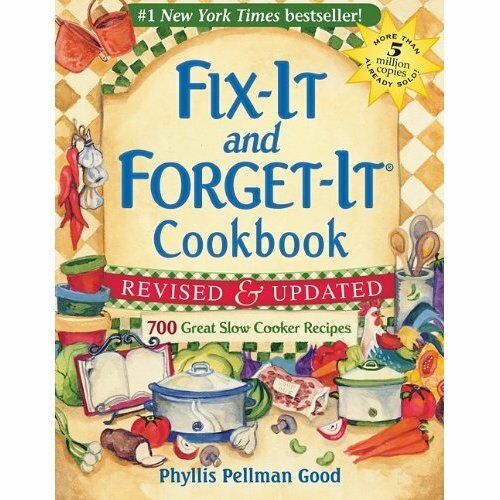 And my favorite all time book for crock pot recipes is the Fix It and Forget It Cookbook. This book is jammed packed with great recipes for soups, main dishes, dips, etc. I have used this one over and over again with great success. So if you feel like you’re in a cooking “rut” jump on the internet, or go through your old cookbooks and find a new recipe. Try it out on the weekend or on your day off when you have a little more time to spend in the kitchen. Happy cooking everyone!